How Much Does a Surgical Tech Make per Year? Also known as operating room technicians, surgical technologists have to assist in surgical operations, prepare operating rooms, help doctors during surgeries, and arrange the equipment. Most surgical technologists work in hospitals and spend most of their time on their feet. However, the surgical tech salary isn’t really worth the long work hours and large workload. With an average salary of $44,330 per year or $21.31 per hour, the typical entry-level education required for the position is usually a postsecondary nondegree award. It is, in fact, a very balanced job, as the low education requirements and the much faster than average job growth more than make up for the salary of a surgical tech. Surgical Tech or Surgical Technologists are vital members of operating room teams, which include the surgeons, anesthesiologist and also a circulating nurse. They work supervised by the surgeon unless prohibited by the state law or hospital policies. Maintains the operating room, sterilizes equipment and prepares patients for surgery. A surgical technologist helps in preparing the surgical procedures by setting up all the equipment, and supplies, like drapes, gowns, gloves, suction tubing, and receiving solutions and medications from the circulator. Providing surgeons instruments upon request, and check to ensure it is all working correctly and make any necessary adjustments. They are also responsible for ordering of supplies and maintaining all files and records of procedures. A surgical tech program is a combination of medical training with traditional arts and science courses. Classes cover medical terminology, surgical theory and procedures, anatomy and physiology, culture and diversity, mathematics, psychology, and computer applications. Also, clinical practice can provide hands-on training so students can know what to expect when they enter the operating room for surgical assisting. To work as a qualified Surgical Tech, it requires an associate’s degree program, diploma or certification in surgical technology. Some vocational schools, colleges, and hospitals give this training that can take at least several months to two years. Most of the programs require a high school diploma, and there are a lot of accredited training programs available, according to the Bureau of Labor Statistics. As with most other jobs in the medical system, the average surgical tech salary is influenced by a wide array of factors. 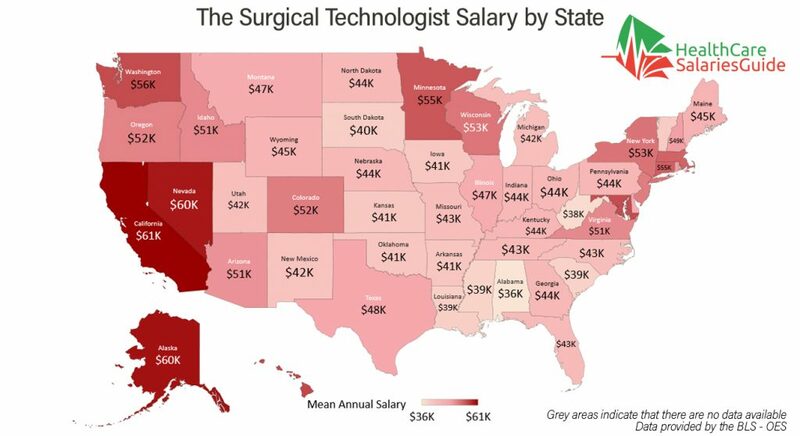 From the level of experience of each employee to the geographic area where the job is located and even to the industry in which the surgical tech is hired, all play a huge role in determining the salary range for surgical techs. Below, you will find a series of tables documenting the American states and metropolitan areas which offer the highest surgical tech salaries, as well as the ones which offer the highest employment levels for the occupation. If a state isn’t present on the list, it doesn’t mean that there are no job openings or that the state only offers very low pay. Instead, it only means that it wasn’t in the top five. As mentioned before, there are multiple factors that influence the average salary of a surgical tech. 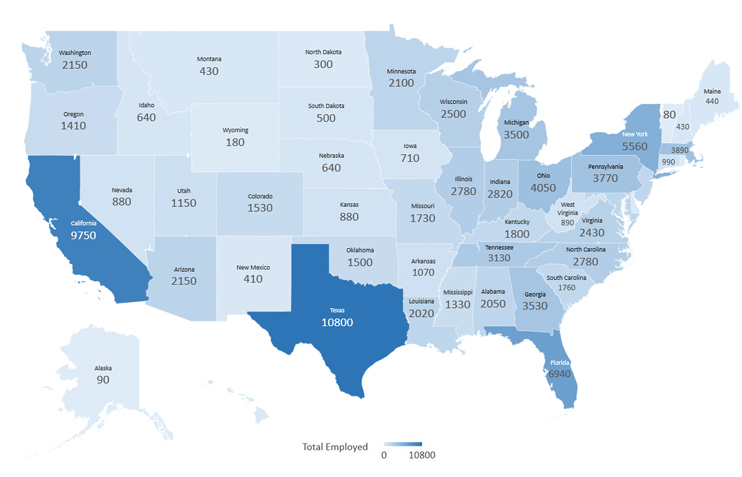 The level of experience of the potential employee, as well as the industry in which the job takes place, has perhaps an even greater influence on the surgical tech salary than the geographical location. For example, the certified surgical tech salary of someone from Georgia, Illinois, Missouri, Utah, Michigan, Louisiana, or Arkansas will automatically be much greater than the surgical tech starting salary of someone from San Diego, CA, Wilmington, NC, Miami, FL, Bridgeport, CT, Philadelphia, PA, or Charleston, SC. Salary.com reports the average salary of a surgical tech at C$44,236, the equivalent of US$33,417. A beginner surgical technologist earns around C$35,651, or just under US$27,000 per year. However, after about 5 years, surgical techs become eligible for a bonus of C$1,578, or about US$1,192. After 10 to 20 years of experience, a surgical tech can earn over C$53,866 (US$40,690) per year without bonuses and other perks. A surgical tech that works in the United Kingdom will earn, on average, £45,000 or US$ 54,553 per year. Those working in or nearby London can have salaries up to 20% greater than their peers, with the average for this area at around £49,050, or US$59,510, per year. Surgical techs working in the Southeastern region earn the second highest salaries by area: £46,350, or US$56,307. Interestingly, though, the salaries of surgical techs in the UK seem to vary not only in terms of location, experience, and industry but also by age. The starting salary for surgical techs revolves around £33,750 (about US$41,000), while experienced professionals can expect wages of £52,200 (US$63,424) or more. The average surgical technician salary in Australia is set at AU$61,060, or US$44,867. A beginner will start off at about AU$25,000, or roughly US$18,400 per year. After just 5 years, though, a surgical tech will earn as much as AU$40,000 – the equivalent of US$29,400. With time and experience, professionals in this field can reach annual salaries of AU$114,400 (US$84,043) or more. Although no info the surgical technician salary is available for New Zealand, we can take sterilizing technicians as a reference. According to careers.govt.nz, the average salary of a sterilizing technician in New Zealand revolves around NZ$48,000, or about US$33,600. A beginner sterilizing tech starts at about NZ$31,000, or a little over US$21,500. However, years of experience can raise the yearly wage of a professional in this field to NZ$54,000 (US$37,765). Even though there’s no info on the surgical technician salary in India. we can use the medical and/or clinical lab technologist salary as a reference. Therefore, the average yearly pay for a medical technologist revolves around Rs 245,214, or about US$3,600. A beginner in this field starts at about Rs 146,817 (US$2,153). But in time, experience and bonuses can bring the yearly pay up to Rs 710,155, or about US$10,416. According to Payscale, a surgical technologist makes around R180,000 – which translates to US$13,142 – per year. According to the same website, an instrument tech starts at about R160,780 (US$11,726) and can earn over R557,941 (US$40,692) with experience and bonuses. However, the national average for instrument technicians is higher than average surgical technician salary: R363,000, or US$26,473. Interestingly, the level of experience doesn’t affect the salary of surgical techs all that much in and of itself. The bulk of the difference is made by certifications and other credentials. For example, an assistant surgical vet would make less than a nurse anesthetist, and a novice traveling surgical tech salary is higher than that of a scrub who doesn’t travel. But if we are to focus solely on the difference in pay made by the level of experience of the employee, we would first have to look at the average salary. And according to payscale.com, the average starting salary of a surgical technologist is $36,000 per year – barely above the minimum wage. As for the industry to which the surgical technician job description belongs, it can yield differences of up to $10,000 or $15,000. However, the higher salaries are still part of the higher percentile. This means that the top paying industries for each salary aren’t the ones that are offering the largest amount of jobs – but on the contrary. If you are interested in other jobs in medical technologies, you might want to know that a radiology tech makes a little over $55,000 annually in the US and a medical technologist – about $60,520 per year. Ultrasound technicians seem to earn the most in the field in the US: $68,970 per year. The working hours for most surgical techs are as chaotic as any in healthcare. Night shifts, working nights, weekends, and holidays are part of the job description. However, this doesn’t necessarily mean that that average work week is more than forty hours long – it all depends on the industry in which the job is located. In hospitals, many surgical techs are on call, meaning that they have to be ready for emergencies at any time. In other settings, such as for Professional and Commercial Equipment and Supplies Merchant Wholesalers, the job might be far more office-based. This would mean that the hours are shorter than for those operating room technicians working in hospitals. Because of the objectively low surgical tech salary and the highly exhausting and stressful work, most surgical techs have very appealing benefits packages. These usually include full healthcare insurance, vacation and holiday pay, regular sick leave, and even a 401(k) plan. As for bonuses, the usual sign on bonus for the average surgical technician is somewhere around $1,000 or $1,500. Additional bonuses and profit sharing usually amount to another $5,000 per year. Of course, these bonuses can vary depending on the industry and level of experience of each job and employee. The level of employment of most surgical technologists is expected to grow 15% by 2024, much faster than the national average for all professions. This is owed to a number of factors such as advances in medical technology, the increase of individuals with health insurance, an increased demand for surgical services, as well as the general increase of the elderly population. Having perhaps one of the most poorly paid jobs in healthcare, the average operating room technician doesn’t have it as bad as many seem to believe. 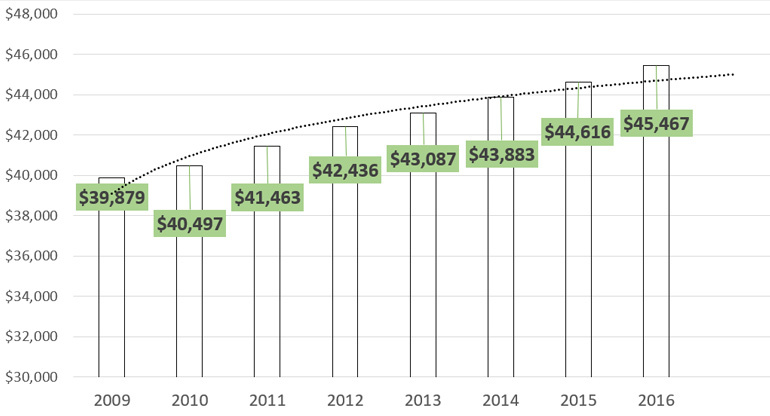 The relative accessibility of the position, the decent schedule, the bonuses, and benefits packages, as well as the overwhelmingly positive job outlook, make the surgical tech salary seem worth the effort.